Booted into the XP partition and used xcopy to copy the files in the DOS620 partition to a thumb drive. First used C:\> dir /AHS to identify the hidden and system files. Disk Director seemed to be the most straightforward of the three. However, after reading some reviews on the Web where some users stated that the partitioning function was not reliable, I decided on the Partition Manager product. Purchased Partition Manager Personal Edition (download) from the Paragon website while a special price was being offered. Installed Partition Manager on my WinXP partition and created a recovery CD. Created XP Recovery CDs from the Sony Recovery Partition. Used Partition Manager to delete the Sony Recovery Partition (5GB). Repartitioned the Hard Drive to reclaim the 5GB Recovery Partition. Allocated approximately 1.2GB at the beginning of the disk for the DOS partition formatted as FAT16. What may or may not be obvious is that merely copying all the files from the thumb drive will not produce the desired result. Yes, the files will be copied but the partition won’t be bootable. There are probably several hacks available to get this working. I decided on using the tried and true Sys C: command. In order to run the Sys command you need to be booted from a DOS floppy, but the laptop doesn’t have one. Decided to try and create a bootable CD with a DOS 6.20 system. Decided to try Magic ISO Maker. Decided to Search the web for a DOS 6 bootable image that I could burn to a CD. Found one at http://www.allbootdisks.com/download/iso.html. This was all well and good but there wasn’t a 6.20 version available. So, I decided to download the 6.22 version even though it wasn’t the DOS version I was running. I decided to trash Magic ISO Maker and downloaded ImgBurn. ImgBurn created the bootable DOS CD successfully. Booted from the DOS CD successfully and ran the Sys C: command to transfer the system to the hard disk partition. Rebooted XP and installed Paragon Partition Manager. After reviewing the Paragon user guide, no mention was made of how to get Partition Manager to recognize an already installed operating system. However, it will guide you through the process of installing a new OS from scratch but that was not what I was trying to do. So, I de-installed Partition Manager. Then decided to purchase Acronis Disk Director from Amazon.com for a much cheaper price than what was asked for on the Acronis website. Installed the Acronis Disk Director Suite 10.0 and OS Selector. On the first attempt Acronis was able to recognize both DOS and XP partitions and created the appropriate selections in the boot menu. However, after multiple re-boot attempts, Acronis would add another DOS selection in the boot menu. It was also creating a bizarre file structure in the XP partition which kept getting deeper and deeper after each re-boot. After some thrashing around trying to clean it up, the XP partition wouldn’t boot. Re-installed Windows XP from the Vaio recovery DVD. I brought the entire system back over a weekend. The only data loss was my Outlook Address Book and emails that weren’t archived. I still needed to acquire a reliable boot manager, so I purchased the Terabyte BootIt NG Boot Manager and Partition Tool. It is the most comprehensive utility out of the three that I tried but Terabyte has very good documentation and also a number of videos which step you through the installation and configuration process. I chose these options because I wanted to maintain compatibility with FDISK and I didn’t want any debris lying around in my XP partition in case things went wrong. Followed the User Guide and created a bootable CD. Installed BootIt NG and selected the Choose Partition Manually option. Created and formatted an 8MB primary partition for the BootIt EMBRM. BootIt NG installed successfully and recognized both DOS and XP partitions. Re-booted multiple times to verify that each operating system could be booted and was operational. From XP on the laptop, copied the files from the thumb drive created from the original installation to the new DOS partition. Did not re-copy the system files: IO.SYS and MSDOS.SYS. After copying the files and attempting to run a command, DOS complained with the error: “Incorrect DOS version” because the DOS system files are version 6.22 and command.com is version 6.20. After searching the Web, found an MS-DOS 6.2 Step Up download from the Microsoft web site. Booted from the DOS partition on the Pentium II PC and installed the MS-DOS 6.2 Step Up software. Booted from the XP partition on the Pentium II PC and copied all DOS files except IO.SYS and MSDOS.SYS to the thumb drive. From XP on the laptop, copied the new DOS files to the DOS partition. Re-booted into the DOS partition and verified the DOS commands were able to execute. From DOS, removed the System Commander files. Followed troubleshooting suggestions in the QEMM User Guide without success. Searched the Web for suggestions on how to resolve the error including removing QEMM and reinstalling to force the Optimize to run on a clean install all without success. Finally, I found a suggestion for changing the QEMM386.SYS parameters one by one to find the offending parameter. I tried this on a few of the parameters and then gave up. After some deliberation, I decided to try using the DOS memaker utility which was supposed to be improved in DOS 6.22. Prior to running memaker, edited autoexec.bat and config.sys to remove references to QEMM. After running memaker successfully, the next step was to verify that Windows 3.1 would still work. From DOS, ran the win command to invoke Windows 3.1. Since the file 386PART.PAR file was also copied into the DOS partition, Windows complained that it was missing or corrupted. Fortunately, Windows prompts you for permission to recreate it. Success! DOS and Windows 3.1 are both fully functional including the Windows apps. To my surprise, both the attached USB Mouse and the laptop Touchpad Mouse both work in DOS SHELL and Windows. Obviously, the Alps touchpad in the laptop uses the standard PS2 interface as does the keyboard. Update a Gateway laptop running Vista Home Premium 32-bit to Vista Ultimate. Upgrade the current installation in place without having to perform a clean install. The first problem was finding a Vista Ultimate Upgrade version. The Microsoft website was not helpful because Windows 7 was already released and they want you to upgrade to Win7. Found a version on Amazon.com for under $100, Windows Vista Ultimate (Product) REDTM on DVD (no longer available). Before placing the order, read all the customer reviews to verify that the upgrade will in fact allow you to upgrade from a current Vista installation. The reviews seemed to indicate that you could upgrade Vista. Clean install to Vista Ultimate 32-bit SP1 successful. Connect three laptops to a Windows 2000 Advanced Server domain. Select “Internet Protocol (TCP/IP)” and click Properties. On the Properties dialog box, click the General tab. On the General tab, select “Use the following DNS server addresses” and enter the router’s IP address in the Preferred DNS Server field and the Server DNS in the Alternate DNS Server field, click OK to complete the changes. On the System Properties dialog box, click the Computer Name tab. Select “Change” To rename this computer or join a domain. On the Computer Name Changes dialog, Member of option, select “Domain” and enter the domain name. Enter a username/password when prompted. 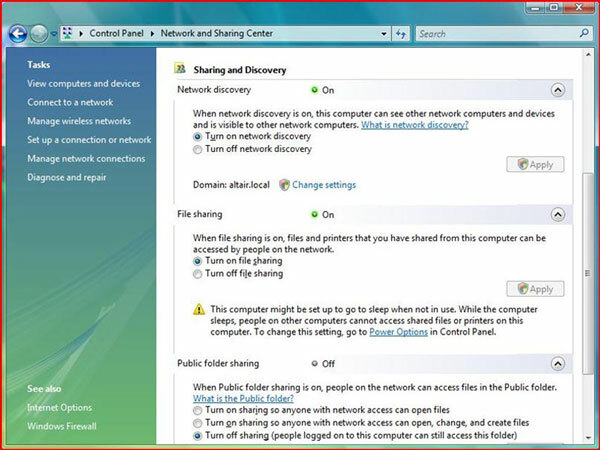 From the Network and Sharing Center, make the following selections shown in Figure 1. In the Network Discovery section, Click Change Settings. Select “Change” To rename this computer or change its domain or workgroup. Enter a username / password when prompted. 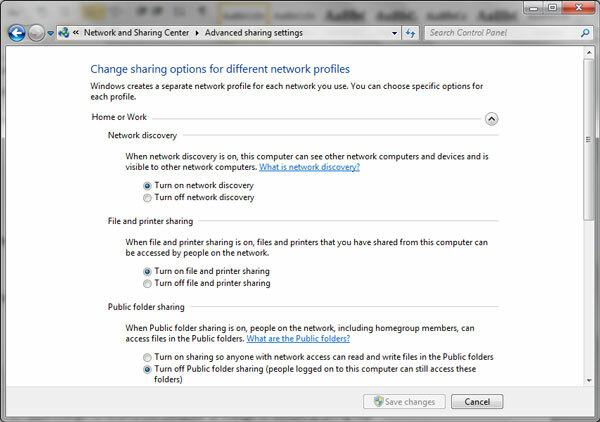 From Network and Sharing Center, click Change advanced sharing settings. Expand the Home or Work section. Make the following selections shown in Figure 2. Click Change Settings in the Computer name, domain and workgroup settings area. Click Change To rename this computer or change its domain or workgroup. Verify the following selections shown in Figure 3. Create a virtual machine using the existing DOS / Win 3.1 partition exactly under Oracle VirtualBox. 1. Downloaded and installed the latest VirtualBox version from https://www.virtualbox.org/. 2. Since Windows 3.1x requires DOS to be installed first, the temptation is to create a DOS virtual machine first. This is incorrect. Create the new machine as Windows 3.1, then install DOS. 3. My running DOS version is MS DOS 6.22, but I don’t have the 3.5” installation diskettes anymore. I found a site, https://www.kirsle.net/msdos, that provided the disk images I needed to install the VM. 4. Installation from a virtual install disk is lightning fast. 5. The next step is getting Windows 3.1 installed. Again, I don’t have the original installation diskettes so I had to download the disk images also. 6. I downloaded Windows 3.11 images and installed those. However, my running version was Windows 3.1 so I was out of sync. 7. During my previous exercise with migrating to a PC laptop, I purchased a USB 3.5” floppy drive. That’s all well and good but I don’t have all the application and development tools diskettes that I would need to install from scratch. Even if I did have the diskettes, reading the USB floppy drive from within a virtual machine is slow beyond belief. 8. Then I remembered that I had a CD-ROM driver, CDTECH.SYS, in my running DOS partition so I copied the folder to a real 3.5” floppy using the USB drive and copied the folder to my DOS VM. 9. Ran the install in DOS which updated my AUTOEXEC.BAT and CONFIG.SYS files. The CD-ROM drive was recognized by the driver so I was ready to go. 10. I booted my laptop into Windows XP and copied all files and folders from the DOS partition to a USB thumb drive. Then I took the thumb drive to my Windows 10 PC that my VMs are running on and burned a CD from the thumb drive. 11. Then, from within the DOS VM, I used XCOPYto copy each folder except WINDOWS and DOS to the DOS VM. 12. I then used MOVEto rename my existing AUTOEXEC.BAT, CONFIG.SYS and WINDOWS folder as a backup. 13. Finally, I copied AUTOEXEC.BAT, CONFIG.SYS and WINDOWS folder to my DOS VM. 14. After restarting the DOS VM, I noticed an error on the CD-ROM driver. Also, some of my applications were throwing errors in Windows. I troubleshooted the problems by doing a stare-and-compare between the file systems on the real DOS partition and the DOS VM. 15. As expected, after typing WINfrom the DOS prompt, Windows complained about a corrupted swap file. Fortunately, Windows guides you through the steps needed to correct the issue. 16. After testing out my apps in Windows, I discovered that XCOPYwas a little wonky. My C:\CDROM folder had another subfolder with all the files so they weren’t found during startup. My Automap application had a folder named USA.MAP which XCOPYcreated as USA_MAP so the map wouldn’t run and finally, I found many files containing a dash (“-“) were created with an underscore (“_”). 17. After correcting the issues, I was in Fat City.